You may know by now how obsessed I am with anything remotely Mexican. Enchiladas, tacos, burritos, they’re all welcome in my house – we even spent our honeymoon in Mexico, and ate our weight in tortillas and guacamole (no complaints here). Often though, Mexican food isn’t exactly the healthiest option – not the way I make it, anyway (I may occasionally go a little overboard on the cheese…). 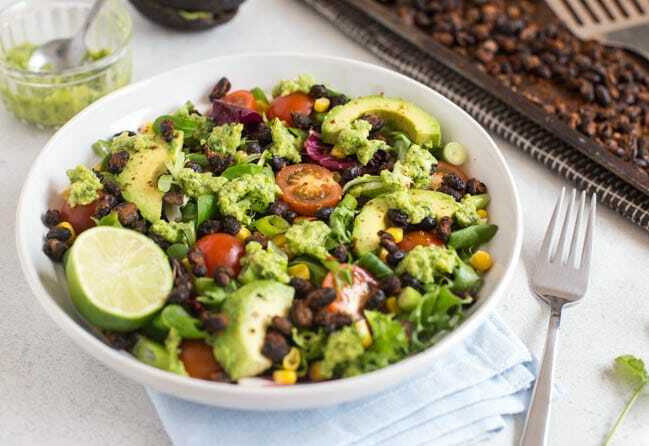 So today I thought I’d offer a healthier way to enjoy your favourite Mexican-inspired flavours, with this super easy roasted black bean taco salad – complete with a creamy avocado lime dressing. The spicy roasted black beans were a bit of an experiment, but since I love roasting chickpeas, I figured black beans should roast up nicely too – and I was right! You don’t want them to end up like bullets – just roast them long enough that they get slightly crispy. They add a brilliant crunch to this taco salad, as well as being a great vessel for all those smoky spices. I used paprika, cumin and chilli, but go crazy. The roasted black beans may be the star of the show in this taco salad, but you need a great base too. I used Florette‘s Classic Crispy salad, which contains a really nice mixture of lettuces – some frizzy leaves, some round leaves, and a few purple leaves for that big flavour. One of the best things about taco salads is that every bite is different, and the same can be said for these salad mixes – I love having a bit of everything in one bowl. 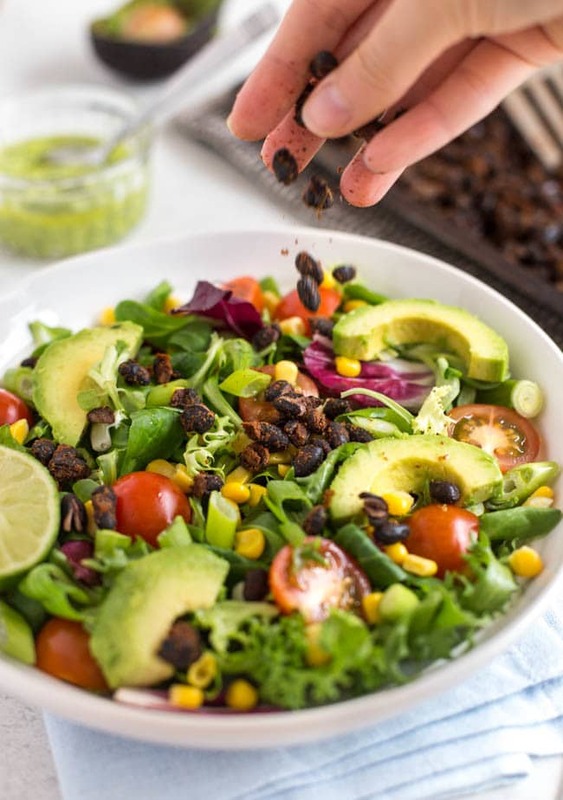 Just fill your bowl with the Florette salad, top it with corn, avocado, tomatoes, and whatever other veggies you’ve got your eye on, and then scatter over those crispy roasted black beans. Don’t forget the avocado lime dressing! It gives a lovely creamy texture. I think taco salads usually contain some crispy tortilla pieces (I guess that’s what makes them taco-inspired), but I skipped those – they’re just not necessary when you’ve got the crispy roasted black beans anyway. So I suppose this probably isn’t technically a taco salad, but oh well. When something’s this delicious, I’m not worried about the technicalities. Have you ever made a taco salad? What else would you add to your Florette crispy salad to transform it into a tasty dinner? Add the rinsed black beans to a large bowl with a dash of oil and the spices. Toss well to coat, then spread them out in a single layer on a baking tray. Roast at 190°C (Gas Mark 5 / 375°F) for around 25-30 minutes, tossing halfway, until crispy but not overly hard. To make the dressing, add the fresh coriander (cilantro) to a mini food processor, along with the garlic. Blitz well until finely chopped. Add the lime juice and half an avocado, and blitz again until smooth. Season to taste. 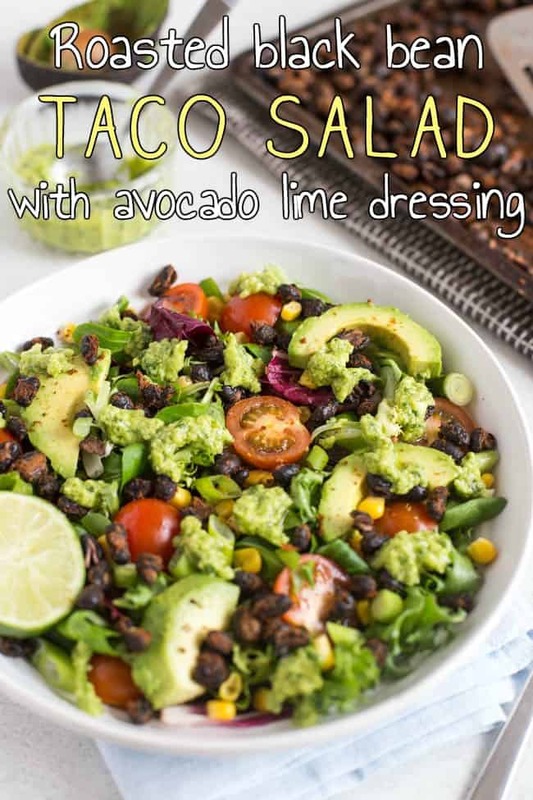 To assemble the taco salad, fill two large bowls with salad leaves, then top with the tomatoes, sweetcorn, chopped spring onions, and 1/2 an avocado. Finish with the roasted black beans and the avocado lime dressing, and serve immediately. Love easy Mexican recipes? 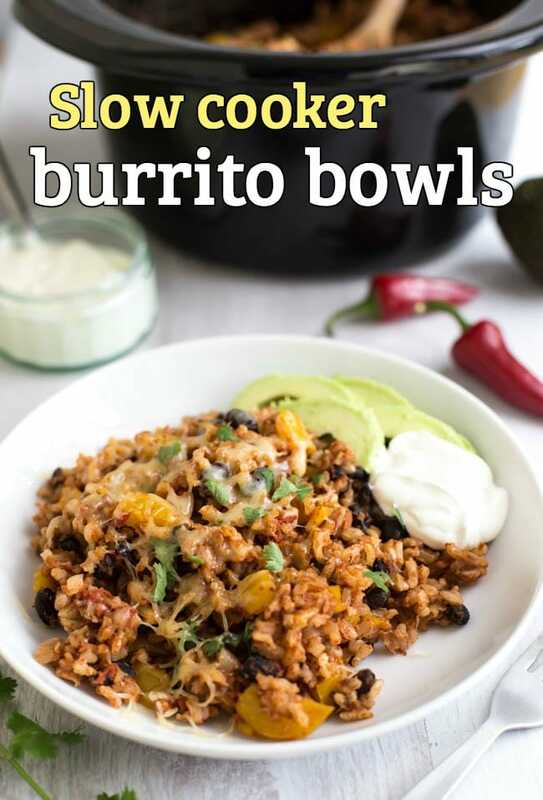 My slow cooker burrito bowls couldn’t be easier – just throw everything straight in the slow cooker! I promised my sister I’d cook her a healthy Mexican meal at the weekend and knew you’d have tonnes of inspiration. I’m not sure she will settle for a salad but I will definitely be making this for my lunches over the coming weeks. My goodness this sounds absolutely heavenly! All your recipes are just so mouthwatering! Taco salads are the best! And there are so many yummy ingredients that you can add to the salad. Love how you added roasted black bean yum! What a delicious taco salad! I love them and really like the idea of roasted black beans. Thanks so much! What a healthy n Delicious looking salad and the roasted black beans look super yum. Pinning for later use. I love the idea of roasting the black beans. Brilliant! I too have roasted chickpeas but didn’t realise this would apply to other legumes. The flavour combinations in this salad sound delicious. This is ingenious, love the roasted black beans in a taco salad, very different! Loving all the flavours of this Tex-Mex salad. This is perfect for a quick and tasty weeknight dinner. I never had roasted beans before!!! Looks delicious!! Looks like a fab vegan lunch. Avo truly makes the world go round! I’ve never thought to roast black beans before using them. What a great idea. I usually just use them straight out of a can. I am definitely going to try to spice them up next time I use them. This salad looks delish for Taco Tuesday in my house! I usually do as well but this was such a great change! I’ve never come across roasting black beans before, lovely idea to add texture to this gorgeous salad! Roasting the black beans is simply genius! I’m soooo desperate to try these asap! I just can’t get over how beautiful that looks! I was sure I already left a comment on this recipe. I must be going mad. Love this salad. Black beans are so creamy and satisfying. Yummed, stumbled, pinned and tweeted. LOVE taco salads! They are always such a great meal to throw together! Im loving this recipe. Cant wait to try it! Never thought to roast black beans!! I will really have to try them. I bet the almost act like a crouton or something on a salad. 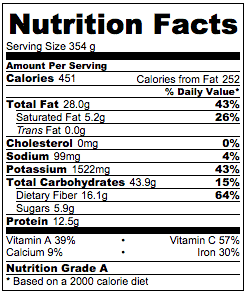 I love avocado, it has good fat and can actually help you lose weight! Absolutely, full of good fats and so delicious too! Love how fresh and vibrant this looks and the roasted black beans are a new one for me. They were new for me too but they work so well! I don’t think I want any taco salad but yours from now on. It sounds just wonderful. 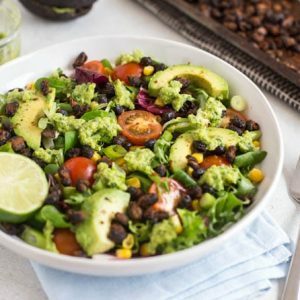 Love Mexican flavours and that avocado lime dressing is just dreamy. 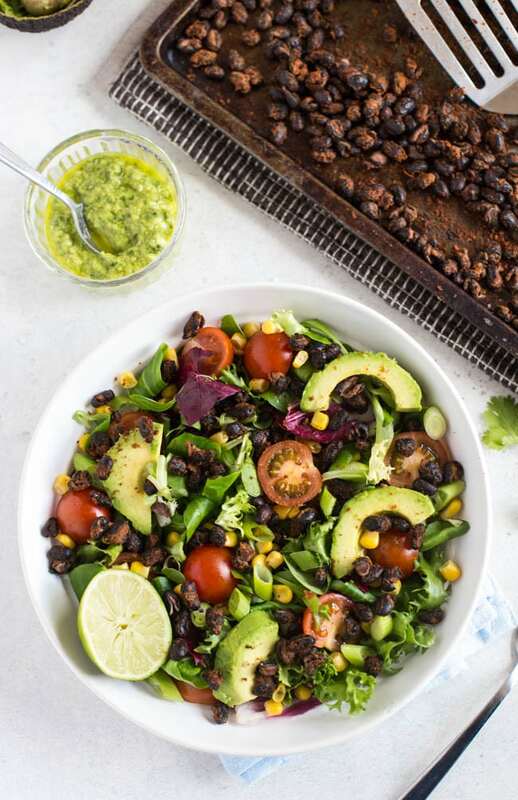 The roasted black beans sound so good, I will definitely be trying them with my favourite Florette salad! 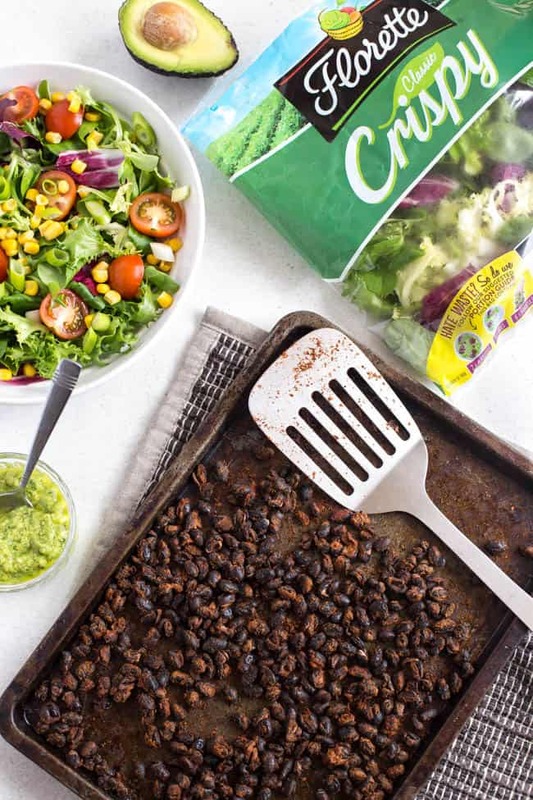 Roasting black beans – what a brilliant idea – I love the crunch they must add to this salad. Love this salad! I have some black beans left, so I am surely making this one! WOW! This salad looks amazing. Can’t wait to try this one! I honestly have created a grocery list so I can make this for my work lunches for the next few days! I love this recipe! Thanks for sharing. Thanks Catherine, they really do take this salad up a notch!